This fall, we will begin our new Ecuador trip through the magnificent and cultural high Andes. We start our adventure in the city of Quito at 9,350 feet. From there we will begin the expedition by climbing and exploring as we climb a variety of grand volcanoes; acclimatizing on Cotacachi; Imbabura; and summit attempt on Cayambe. Sleeping in various huts and camps, we will take in the local culture and amazing views. Join us on this journey as we post daily dispatches from the heights of the Andes. November 15, 2007  Two Team Members Summit Chimborazo! 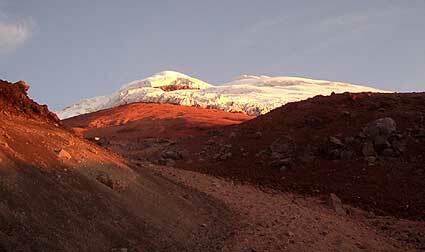 November 8, 2007  Team Summits Cayambe! November 5, 2007  First Summit and Team Success!